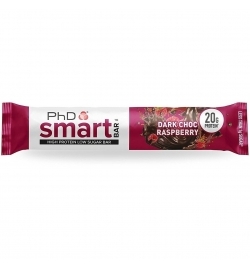 Η Zero Bar της BioTechUSA είναι μια πρωτεΐνη με ένα εξέχον ποσοστό πρωτεΐνης 45%* και υψηλή περιεκτικότητα σε φυτικές ίνες. 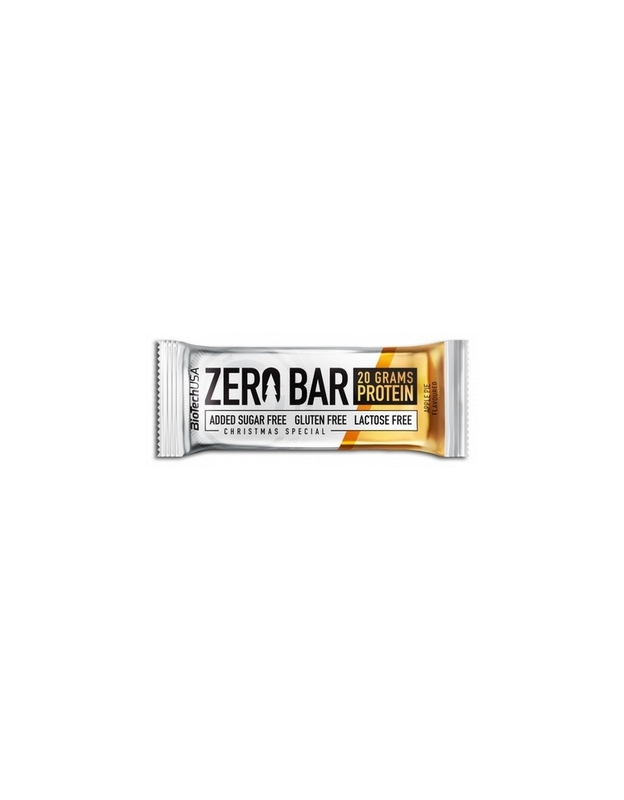 Από τη Zero Bar της BioTechUSA εκμηδενίσαμε οτιδήποτε μη απαραίτητο. Είναι χωρίς γλουτένη, λακτόζη, ζάχαρη, ασπαρτάμη και γενετικά τροποποιημένους οργανισμούς. Επιπρόσθετα σε όλα της τα οφέλη, η Zero Bar είναι ένα τέλειο γεύμα. Η υψηλή σε πρωτεΐνη και χαμηλή σε υδατάνθρακες περιεκτικότητά της, την κάνει ελκυστική σ' αυτούς που βρίσκονται σε δίαιτα, διότι για να χάσεις βάρος, πρέπει να λαμβάνεις πρωτεΐνη σε ικανοποιητική ποσότητα και ποιότητα. Σε αντίθεση με άλλες μπάρες πρωτεΐνης, δεν έχει επικάλυψη που να εμπεριέχει περιττές θερμίδες, ωστόσο, έχει τρομερά νόστιμη τραγανιστή υφή πρωτεΐνης. Πάρτε (1) Zero Bar μετά την προπόνηση, ή οποιαδήποτε ώρα μέσα στη μέρα. 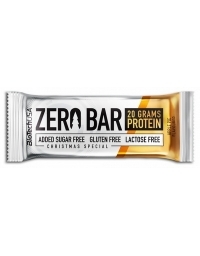 Zero Protein Blend (whey protein isolate, egg white protein, hydrolized protein, calcium caseinate), palm fat¹, fructooligosaccharides, humectant (glycerine), sweeteners (maltitol, sucralose, steviol glycosides), cocoa powder, water, crunchies (hydrolized soy protein isolate), chocolate pieces [cocoa mass, sweetener (maltitol), cocoa butter, emulsifier (soy lecithin), flavour], emulsifier (soy lecithin), gelling agents (carrageenan, potassium chloride), flavours, acidity regulator (potassium tartrates), coconut fat, preservative (potassium sorbate), cinnamon, DL-alpha-tocopheryl-acetate. 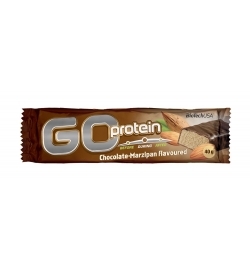 ¹The product contains only cold processed, RSPO certified sustainable palm oil. 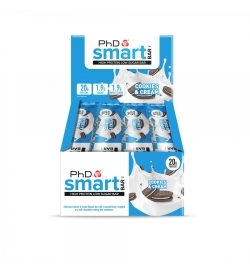 Zero Protein Blend (whey protein isolate, egg white protein, hydrolized protein, calcium caseinate), palm fat¹, fructooligosaccharides, humectant (glycerine), sweeteners (maltitol, sucralose, steviol glycosides), crunchies (hydrolized soy protein isolate), water, flavours, emulsifier (soy lecithin), gelling agents (carrageenan, potassium chloride), acidity regulator (potassium tartrates), coconut fat, preservative (potassium sorbate), vanillin, DL-alpha-tocopheryl-acetate, colour (Allura Red AC)*. *May have an adverse effect on activity and attention in children. 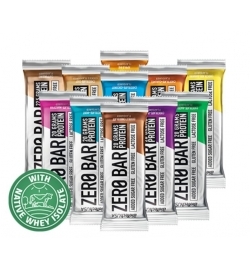 Zero Protein Blend (whey protein isolate, egg white protein, hydrolized protein, calcium caseinate), palm fat¹, fructooligosaccharides, humectant (glycerine), sweeteners (maltitol, sucralose, steviol glycosides), crunchies (hydrolized soy protein isolate), water, chocolate pieces [cocoa mass, sweetener (maltitol), cocoa butter, emulsifier (soy lecithin), flavour], flavours, emulsifier (soy lecithin), gelling agents (carrageenan, potassium chloride), cocoa powder, cinnamon, acidity regulator (potassium tartrates), coconut fat, preservative (potassium sorbate), DL-alpha-tocopheryl-acetate. 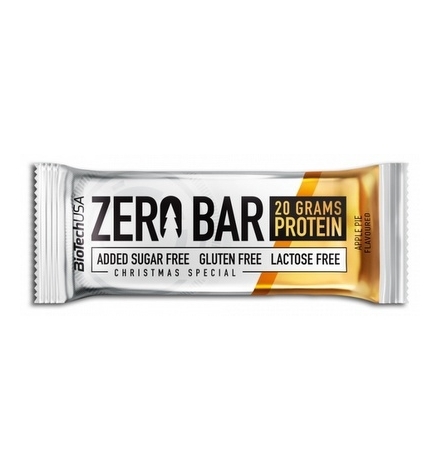 Zero Protein Blend (whey protein isolate, egg white protein, hydrolized protein, calcium caseinate), palm fat¹, fructooligosaccharides, humectant (glycerine), sweeteners (maltitol, sucralose, steviol glycosides), water, crunchies (hydrolized soy protein isolate), cocoa powder, shredded coconut, emulsifier (soy lecithin), flavours, gelling agents (carrageenan, potassium chloride), acidity regulator (potassium tartrates), coconut fat, preservative (potassium sorbate), DL-alpha-tocopheryl-acetate. 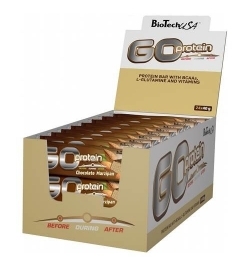 Zero Protein Blend (whey protein isolate, egg white protein, hydrolized protein, calcium caseinate), palm fat¹, fructooligosaccharides, humectant (glycerine), sweeteners (maltitol, sucralose, steviol glycosides), cocoa powder, water, crunchies (hydrolized soy protein isolate), chocolate pieces [cocoa mass, sweetener (maltitol), cocoa butter, emulsifier (soy lecithin), flavour], emulsifier (soy lecithin), gelling agents (carrageenan, potassium chloride), flavours, acidity regulator (potassium tartrates), coconut fat, preservative (potassium sorbate), DL-alpha-tocopheryl-acetate.